Back when the cocktail culture that we all know and love was first coming to life in the 19th century, imbibers would have likely been sipping many a cocktail made with cognac. Classic recipe books by Jerry Thomas, Harry Johnson, Leo Engel, and William “The Only William” Schmidt are filled with cognac-based Cocktails, Sours, Punches, Daisies. Even the Mint Julep, a cocktail so closely associated with bourbon, was a cognac-based drink back in the day. For those legendary bartenders, the preferred style of cognac was known as three star: young enough to be lively and affordable, yet darker, richer in flavor, and higher in proof than the VS Cognacs that represent the modern equivalent. To evoke the spirit of the Golden Age of the cocktail, Pierre Ferrand Cognac is releasing the 1840 Original Formula, a revival of the classic three-star cognac and its first release designed specifically for cocktails. The 1840 was developed by Pierre Ferrand proprietor Alexandre Gabriel and cellar master Christian Guerin, with help from spirits and cocktail historian David Wondrich. Extensive tasting and evaluation of surviving examples of three-star cognacs dating to the early 19th century led to the 1840’s final blend, closely modeled on an extremely rare and well-preserved bottle of Pinet-Castillon Cognac from 1840. Like that venerable cognac, the Pierre Ferrand 1840 is fresh and floral, but with enough tannic notes to let it stand out when mixed into a cocktail. At 90 proof (45% ABV), the 1840 is more concentrated than a standard VS Cognac (typically bottled at 80 proof) and is particularly well-suited to the spirit-forward style of pre-Prohibition cocktails. In honor of New Orleans’ deep cocktail history, the 1840 will launch in the Big Easy during the 2011 Tales of the Cocktail. The first “official” pour of the 1840 in the country will take place in the Pierre Ferrand Tasting Room on Friday, July 22nd at the Hotel Monteleone. 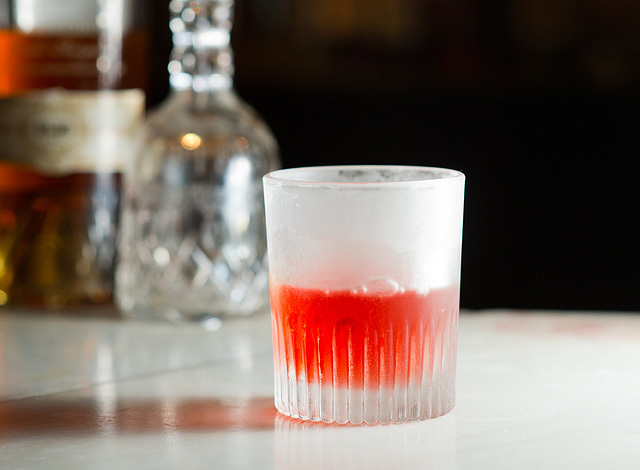 During this session, Pierre Ferrand will be serving The Chanticleer, the signature 1840 Original Formula cocktail (see recipe below). Beginning in July, over 35 New Orleans bars and restaurants are featuring cocktails made with the Pierre Ferrand 1840, including the famed Carousel Bar at the Hotel Monteleone. The Carousel Bar will feature a pair of 1840 cocktails: the Fancy Cognac Cocktail and the 1840 Sazerac. The Pierre Ferrand 1840 Original Formula Cognac launches nationwide on August 1, 2011. The suggested retail price of the Pierre Ferrand 1840 is $45.00 for a 750ml bottle. 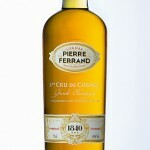 For more information, visit www.pierreferrandcognac.com. All in a day's work for Alexandre Gabriel (L) and David Wondrich (R). Pierre Ferrand Ambre, blended from eaux-de-vie averaging ten years old, is already a mixology darling and can be found on cocktail menus in LA and around the world. As Pierre Ferrand’s first cognac designed specifically for mixing, the 1840 is being positioned by the cognac house to emulate the Ambre’s success and find a place on the back bars of top craft cocktail bars. To showcase the 1840 Original Formula, Pierre Ferrand has shared four classic cocktail recipes, curated by David Wondrich. Put 1 barspoon / 5 ml superfine or caster sugar in a small tumbler. Add 1 barspoon / 5 ml water and stir to dissolve sugar. Add 2 dashes Peychaud’s Bitters or The Bitter Truth Creole Bitters. Add 2 oz / 60 ml Pierre Ferrand 1840 Original Formula. Fill glass with cracked ice and stir. Twist lemon peel over the top and serve. In a mixing glass, stir ½ teaspoon superfine sugar with 1 teaspoon water until sugar has dissolved. Fill glass with cracked ice, stir well and strain into chilled cocktail glass. Twist lemon peel over the top. For an Improved Cognac Cocktail, substitute maraschino liqueur for the orange liqueur and add a dash (or 3-4 drops) of absinthe. In a highball glass, stir 2 teaspoons superfine sugar with ½ oz water until dissolved. Add 5 or 6 mint leaves (from the bottom of the sprig) and press very lightly with a muddler. Add 1½ oz Pierre Ferrand 1840 Original Formula and fill with crushed or finely cracked ice. Swirl with a barspoon until the outside of the glass frosts. Add more crushed ice and another 1 oz of the 1840. Stir again to frost the glass. Garnish with at least 1 sprig of mint (preferably 3), and add a straw. Optional (but highly recommended): before inserting the mint and straw, float ½ oz Plantation Vintage 2000 Jamaican Rum on top by gently pouring it from a jigger over the back of a barspoon. Garnish with raspberries and half an orange wheel cut into 4 pieces.